Sarah Boone began her work in the real estate industry as a commercial real estate agent in the late 1980’s and into the early 1990’s. During this time she provided real estate services throughout Annapolis and Anne Arundel County. She focused her efforts in shopping center, retail and office leasing. 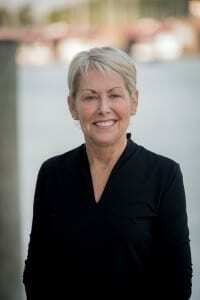 In 1992 she became a licensed real estate broker and started Boone Mitchell Properties with Mitch Nathanson, owner of Coastal Properties in Annapolis, Maryland. She continued her commercial real estate work until August of 1994 when she then started as a Business Location Consultant for Anne Arundel Economic Development Corporation (AAEDC). Her position grew and in 2005 she became the Vice President of Real Estate Development for AAEDC. In her position as the head of the real estate department she oversaw 3 business development associates as they worked with the brokerage, business and development communities to expand and relocate their businesses to Anne Arundel County. She worked with the development and business community to help close transactions valued at more than $60,000,000, bringing over 1,600 new jobs to the County during 2005 to 2014 period. She organized and participated in an annual executive real estate tour growing it to a premier status real estate event. In her recent retirement she has begun work as a consultant in the capacity of a real estate “Project Facilitator” using her years of experience to assist business and real estate owners navigating through the development processes. We specialize in leasing and Sales for Retail/Restaurant, Office/Medical, Warehouse/Flex, and Land properties. We represent both Tenants and Landlords in Commercial Real Estate Transactions. Our firm offers a balance of young energetic talent and experienced professionals. Our background and experience allows us to readily interact with state and local government. We have established an excellent network of contacts and client relationships throughout the region. Serving clients since 1999 our goal is to consistently “Exceed Your Expectations”. Thank you for your interest in Murphy Commercial Real Estate. Please take a moment to fill out the form below to let us know how we can help.